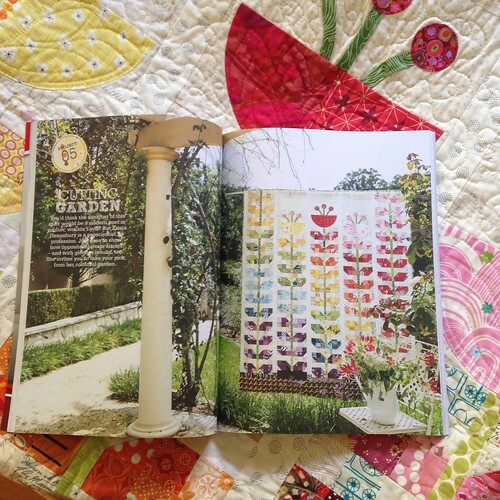 Poppyprint: Cutting Garden featured in Homespun - and a giveaway! Cutting Garden featured in Homespun - and a giveaway! 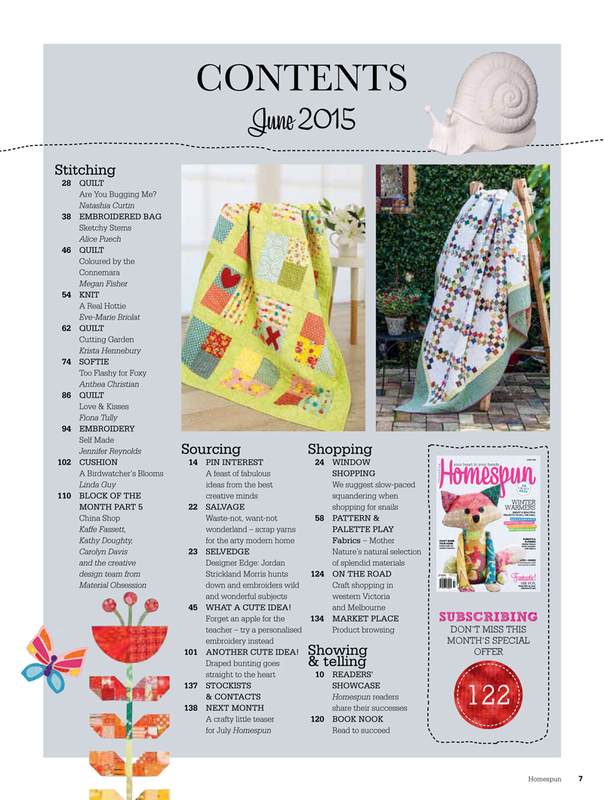 If you've never had the pleasure of reading Homespun Magazine from Australia, I hope perhaps my latest quilt pattern will encourage you to order a copy! This has always been one of my fav sewing publications due to the varied projects (quilting, embroidery, sewing, collaging), gorgeous photography, matte paper, designer biographies and glimpses of quilting life DownUnder. I wish it were easier to find in Canada. If you search online there are a few retailers in North America from which you can order copies. Here's the adorable cover and a little detail of my quilt on the contents page! The story of Cutting Garden is kind of a long one. You may recall that last year I worked with many neighbourhood friends (as well as others from my local quilting community) to make a Scrappy Sprouts quilt for our friend who was diagnosed with cancer. The quilt we made was inspired by a quilt my friend Tracey made with sewing buddies the year before for her friend with cancer. We both feel that the block is sweet and hopeful and I know that both quilts brought so much joy to their recipients. The location photos in the magazine are just stunning and make me so proud to have a project included! Well, the editors at Homespun saw a photo of my quilt online and approached me to create a similar one, but they wanted a design with more flowers and a darker "ground". I first asked Tracey if she wanted the gig, after all, it all started with her block design and quilt. The timing wasn't right for her, but she graciously allowed me to go ahead with a quilt using a smaller version of her block. Because of Tracey's generosity and the origins of this quilt, I've donated my modest design commission to cancer research - that just felt right. The scale of a dresden plate flower didn't work with these smaller sprout blocks, so I designed some folk-art inspired flowers that are made up of two pieced quarter circles, some bias tape applique stems and machine appliqued circles. I love how they look on top of those pretty rainbow sprout stalks. It is really difficult to showcase the scrappy low-volume background fabrics in photographs, but trust me, there are tons of prints in there! One of my fav things about the quilt are the two Heather Ross bumble bees on the flowers (Briar Rose fabric line). This quilt is a fabulous scrap-buster. There is a lot of piecing, so it takes a while, but the results are so pretty. I cut the squares from pressed scraps using my Accuquilt GO!Baby cutter, which saved lots of time. I have a little stash of leftover HST's, squares and stems that I saved for one lucky follower along with a copy of the magazine if you'd like to make this quilt yourself. Please leave one comment below for a chance to win. Your email MUST be linked to your comment, or appear in the comment itself, in order for you to win. I'll choose a random winner next week on my birthday: July 22nd. Good luck everyone! ETA: comments are now closed. Congratulations to comment #74 chosen by the random number generator! The Rx Quilter, you've won!! I'll email you for details on how to get your prize to you. The quilt is gorgeous! Congratulations. This is a spectacular quilt! Thanks for such a great design and a chance to win! what a stunning quilt. I love your graduated colour. Beautiful quilt. Sure to bring a smile to anyone. Congratulations! I love the colors and design, those flowers! Perfection! Very lovely storey behind the making of this quilt. It must carry special meaning for both. Scrappy makes the most interesting quilts. Wow ! That's a real beautiful quilt and pattern. Congratulations! And Thanks for the chance! Love the quilt and the fabric choices! Happy Birthday! I'm a July baby too. I really love this quilt and I'm planning to make one soon. Your quilt is beautiful and what a sweet gesture to donate your proceeds. It's a lovely quilt as was the other one that you made. And both for such great causes. There's so much to love about this quilt, Krista. The colours! The scrappiness! Those sweet sprout blocks! The darling flowers (complete with wee bees)! Then to discover the story behind it and the generosity of you and Tracy - makes it all the more beautiful and meaningful. Congratulations on a wonderful finish and thanks for your generosity! Oh what a lovely giveaway and such a beautiful quilt. Thank you for the chance. Your birthday is the day before my son's. Happy almost Birthday! Cute quilt! 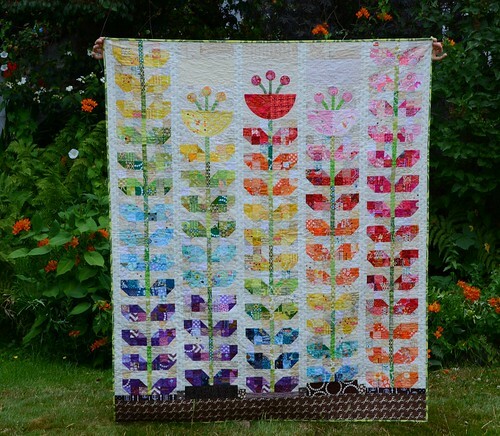 This is a stunning quilt - I adore the flowers at the top!!! So happy - and lovely that you have donated your commission to cancer research. When I saw your first post about the quilt made for the friend I was in awe of the joint creativity that emerged. Now you have gone a step beyond for another deserving cause, congratulation to you both and you choice to donate to cancer research. I'd love to be a lucky winner. Lovely job Krista! You are so cool to donate to cancer research. You've designed a gorgeous quilt! I especially like the flowers. Happy Birthday! And congratulations on being published! This quilt is so very beautiful and I would love to make it! And thank you for donating to cancer research! Congratulations, it turned out wonderful. I have always loved the sprouts quilt...and seeing this one ..makes me so happy...I LOVE IT Krista... It's a beauty... Know I will enjoy making this one..that's for sure!!! the quilt is lovely. 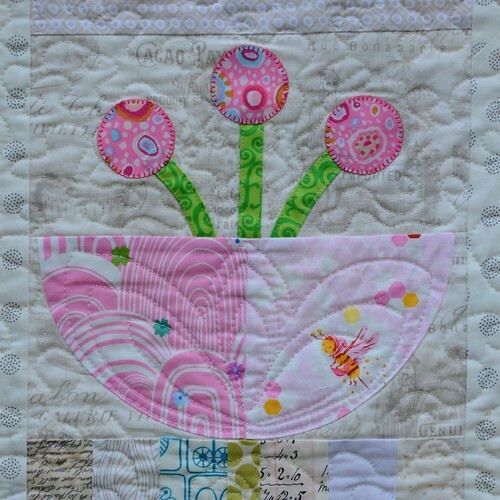 I hope your friend ( scrappy sprouts quilt ) is feeling better & on her road to recovery. I love the bumblebees in this quilt; they are a favorite to embroider. When I opened your post, before reading the title, I said to myself, "What a gorgeous flower quilt! I'd love to make one!" Congratulations on the publish. So thoughtful of you to donate to this worthy cause. Thanks for giving us a chance to win the magazine! This is adorable. I love the scrappy low volume background. Beautiful quilt with a wonderful story. I especially enjoy that you created this warm and welcoming quilt as a gift. A beautiful quilt and a wonderful cause. Would love to make the quilt. Oh no, I feel another subscription coming on!! The quilt is beautiful! Will you produce a pattern that one can buy from you on your website? Would love to win the magazine....my fingers are crossed - toes too. Wow what a beautiful quilt. At first it looks simple, but upon closer look it is very detailed. Congratulations on being published abroad. I haven't seen this magazine, but I will look for it. Your quilt is beautiful and I love the multi shaded background. I have a similar quilt pinned as inspiration. Those scraps would make a great start on a quilt. Thanks for the chance to win them. What a pretty quilt! I love the cheerful colors. 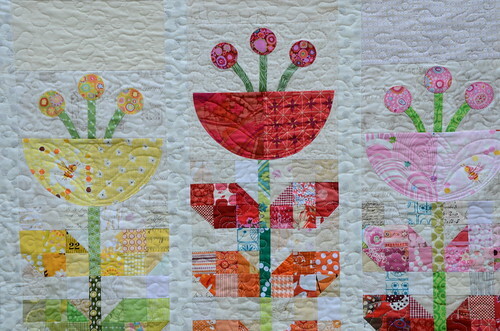 I love this bright, cheery quilt! 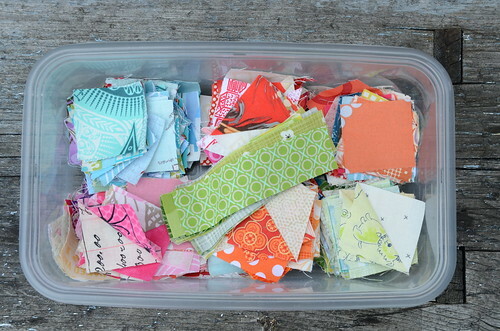 Your scraps are bright and pretty - just what I need to brighten up my dull old stash. Thanks! What a cute and scrappy quilt! Congrats on being published! I remember seeing your original last year. And just how big are those leftover squares anyway....? Krista, you are a really adorable person and talented quilter! I've already loved you and today, I love more!!!!!!!!!! Hugs from your brazilian friend! Love your quilt, It's just beautiful. Thanks for the chance to win. This quilt is fantastic! Scrappy quilts are my favorite -- so interesting to look at. I would love to have this magazine. I've never seen it before but it sounds lovely. I went looking for it today at a local store with many sewing magazines and so far no luck. What a beautiful quilt! It would be great to be able to see it in the magazine. This is beautiful. A quilt similar to this is on my bucket list. Thanks for the opportunity to win. This is gorgeous and I think it is amazing that you are donating your commission to cancer! Bravo. I commented before on the beautiful quilt and have been trying to locate a source for the magazine and can't find one. Can anyone help with this? So many positive comments on this, Krista! How wonderful as they are obviously well deserved. Keep them for a rainy day when you need a little sunshine. You've inspired me too, especially as we have a friend newly diagnosed with cancer. I think this would make such a happy quilt for her and let us show our love for her. Keep on quilting and posting, Krista - it means you are sharing yourself with us at so many levels as the reactions to this post clearly signal. Lovely quilt with a lovely sort. I wouold very much enjoy making my version of this quilt...hope you select me! G.dunn@shaw.ca. Very beautiful, thanks for the chance to win. I LOVE this quilt design. Floral quilts are so gorgeous. Quilty Huggs from Pitt Meadows! Your quilt is absolutely beautiful! Love all the many prints you chose to use! Beautiful quilt and beautiful magazine spread! Congratulations Krista! I thought I had commented already, hmmmm. I love love love this quilt!!!! It is gorgeous!!! I was thinking of ways I could "borrow" it, lol. Beautiful, I love all the colors. I would love to make this for a friend of mine that is having medical issues. I love the rainbow effect! A gorgeous quilt, beautiful colors and pattern. What a beautiful quilt and a very touching story! Thanks for the opportunity! Hello Krista, Are your retreats open to "all" or do you need to be a member of a host quilt guild in order to attend? Thanks, PaddyAnne. So cute, reminds me of Mario Bro flowers. Love this quilt and fingers crossed. Thanks for the chance! Krista, you really rock with this beauty!!! well deserved to be piblished in this prestigious magazine!! I am a cancer survivor - how generous of you to donate your commission ! 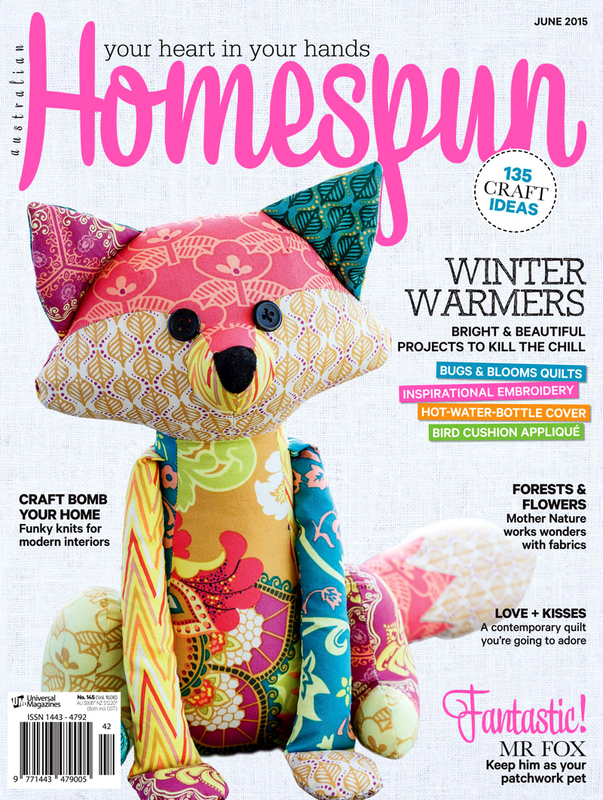 Would love to win this magazine...I love the quilt and the fox on the cover! So beautiful and for such a great cause Generous giveaway Krista! Thank you. Beautiful quilt! The magazine looks very interesting. How wonderful! Thanks for your generosity! So fun! Fabulous quilt ! and happy birthdat!